In this latest Mayor Ravi Bhalla episode of "How I sold out Reform," Hoboken begins to get the picture, literally, how the Mile Square City went from a beacon of reform to a HudCo principality. Seems like only yesterday when Cavedweller Ravibots deemed HudCo entanglements evil incarnate. That was before Mayor Ravi Bhalla incinerated Councilman Jim Doyle's resolution against the upcoming North Bergen Power Plant serving New York City. Doyle's resolution was summarily yanked off the October City Council agenda and hasn't been seen since. Readers here exclusively learned weeks ago of two backroom meetings between Ravi Bhalla and North Bergen Mayor and State Senator Nick Sacco. The visible results are seen below. It's a FacePuncher HudCo lovefest! Can you identify the FacePunchers, Ravibots and Joey the Nose in the photo taken at a Nick Sacco rally? Talking Ed Note: Back with FacePuncher IDs and so much more. Someone get the bottom-feeding cavefish to a toilet. There's a whole lot of hypocrisy to puke up. That's the steady diet for Ravi's paid political operatives and campaign staff talking to each other in Sybil's Cave. Chow down! Front center in red circle from the mayor's office: Jason Freeman. 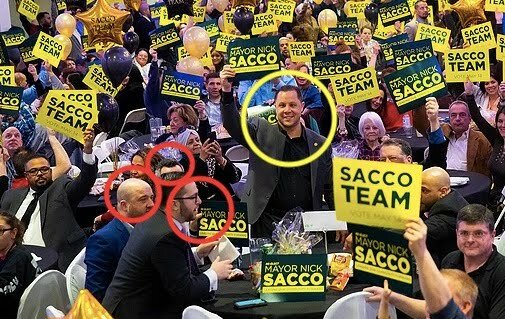 Yellow circle: Nick Sacco senior political aide Joey Muniz who is a highly, highly paid administrator at the Hudson County School of Technology, only one of his government jobs. He collects an estimated $300,000+ annually. Oh yes, Ravi Bhalla paid homage and joined in because he isn't a Dawn Zimmer reform mayor, he's a HudCo mayor.